Connaught | ATAC Resources Ltd.
Additional claims acquired to cover the projected southern extension of the 1 km2 soil anomaly and anomalous ridge and spur geochemical anomalies. The 100%-owned, 115.5-km2 Connaught property is located in the Sixtymile placer gold camp of western Yukon Territory and 65 km due west of Dawson City.It can be reached by four-wheel drive vehicle via the Sixty Mile Road which runs south from the Top of the World Highway.Regionally, the property lies between the Tintina and Denali Faults within a part of Yukon that is mostly underlain by Yukon-Tanana Terrane. Locally, geology can be divided into two main domains: a southern domain underlain by the South Fiftymile Batholith and a northern domain that contains supracrustal rocks of the Nasina and Klondike Schist Assemblages. 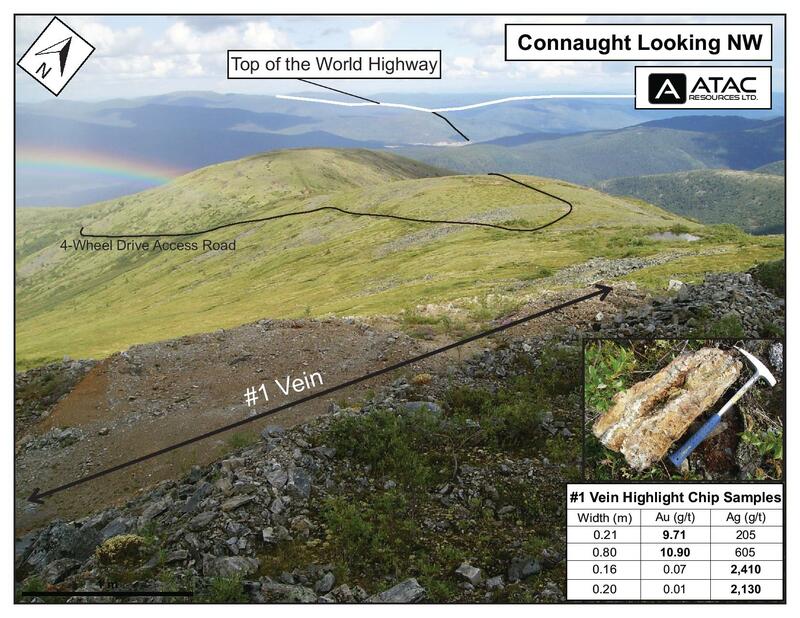 The Connaught project area has mostly been explored as a high-grade silver-lead±gold vein prospect modelled after the highly productive mines in the Keno Hill district, located about 250 km to the east. To date, 20 major vein structures have been identified on the Connaught property. These veins form two sets: one striking east-northeasterly and the other north-northeasterly. Known vein zones are hosted by dilatent fault structures up to several metres in thickness. Individual veins have been traced for lengths in excess of 260 m and most are open in both directions along strike and to depth. Typical vein exposures consist of multiphase quartz that is variable mineralized with blebby to massive arsenopyrite + galena ± chalcopyrite ± covellite ± stibnite ± sulphosalts. Where exposed, the veins are typically 0.3 to 2 m wide and grade between 100 and 3,150 g/t silver, 3 to 64% lead and background to 10.90 g/t gold. The Connaught vein system is directly uphill from the Sixtymile Placer Gold mine, which produced nearly 2,000 oz of gold in 2016. Further systematic exploration is required to evaluate gold distribution and abundance at Connaught. The eastern part of the Connaught property is perspective for porphyry-style mineralization. The area is underlain by a stock of Late Cretaceous granodiorite with a ‘donut’ magnetic low geophysical signature flanked by creeks yielding elevated copper-in-silt values. Where mapped, the granodiorite hosts magnetite veining within pervasively chlorite and epidote altered granodiorite, indicative of a high-level porphyry system. A specimen sample of the granodiorite returned 0.14% copper. 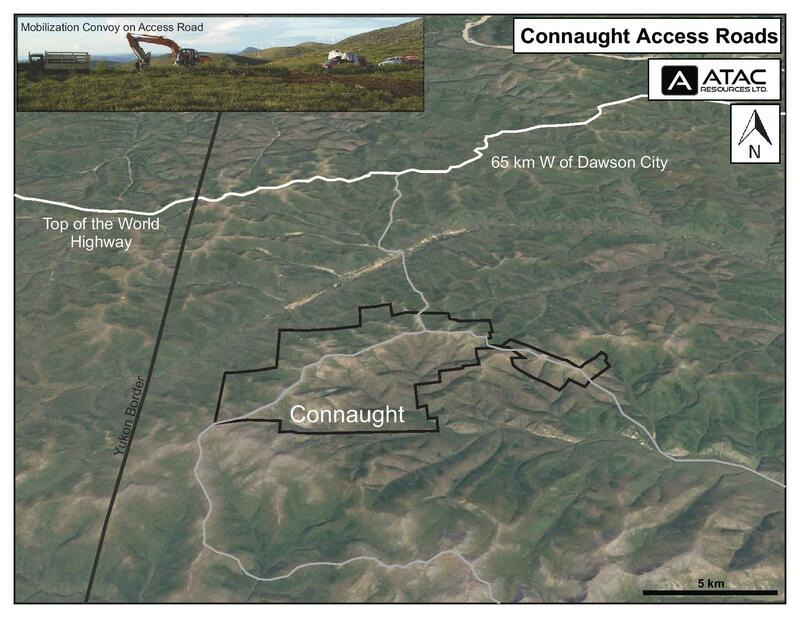 Connaught is located in the Sixtymile placer gold camp of western Yukon Territory. The property lies 65 km due west of Dawson City and can be reached by four wheel drive vehicle via the Sixtymile Road, which runs south from the Top of the World Highway. An extensive system of bush roads and trails exist on the property. The Connaught project consists of 250 contiguous mineral claims located in western Yukon at latitude 63°55' north and longitude 140°48' west. The property lies between the Tintina and Denali Faults within a part of Yukon that is mostly underlain by Yukon-Tanana Terrane. That tectonic terrane is composed of continental margin sediments, island arc volcanics and coeval intrusions, which were metamorphosed and deformed during accretion to the North American continent during Mesozoic times. In the Sixtymile district, the Yukon-Tanana Terrane is subdivided into two stratigraphic elements (the Nasina and Klondike Schist Assemblages) and a metaplutonic package (the South Fiftymile Batholith). The Yukon-Tanana units are intruded by undeformed, Late Cretaceous plugs and stocks. The geology in the vicinity of the Connaught project can be divided into two main domains. The southern domain is mostly underlain by the South Fiftymile Batholith while the northern domain contains supracrustal rocks of the Nasina and Klondike Schist Assemblages. A number of large-scale, northeasterly trending normal faults are present in the region. The Sixtymile River valley bottom may mark the centre of a graben. Eleven major vein structures have been identified in the vicinity of the property. These veins form two sets: one striking east-northeasterly and the other north-northeasterly. The Connaught project area has mostly been explored as a high-grade silver-lead±gold vein prospect modelled after the highly productive mines in the Keno Hill district, located about 250 km to the east. Prior to 2008, ten main veins were known on claims held by Connaught project. Known vein zones are hosted by dilatent fault structures up to several metres in thickness. Individual veins have been traced for lengths in excess of 260 m and most are open in both directions along strike and to depth. Typical vein exposures consist of multiphase quartz that is variable mineralized with blebby to massive arsenopyrite+galena± chalcopyrite ± covellite ± stibnite±sulphosalts. Massive galena±anglesite lenses are intermittently exposed in the core of some veins. The galena is usually coarsely cubic and contains scattered blebs of chalcopyrite. Anglesite weathered surfaces often exhibit botryoidal textures and some show shear textures. The veins and their selvages are usually light coloured compared to the surrounding units and are often tinted green, because of oxidization of arsenopyrite to scorodite and sericitization of mafic minerals. Bleached phyllic- and argillic-altered halos extend up to six metres into adjacent wallrocks. Gold is present in all of the veins but no systematic work has been done to evaluate its distribution and abundance. Exploration is also needed to look for metal zones within this very large hydrothermal system. The Sixtymile Placer Gold Camp is directly downhill from the veins. *True widths are approximately 70% - 100% of the intersected intervals. *All reported intervals are true widths.